The word ‘chateau’ is French for ‘castle’ and the magnificent Fairmont Le Château Frontenac is truly that. 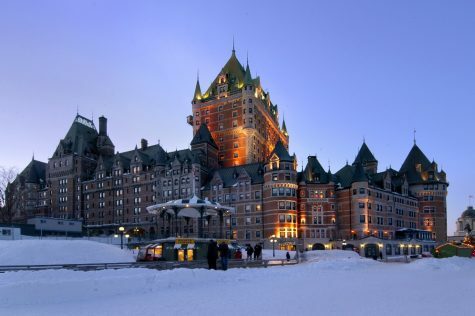 First built in 1893 as a French chateau-inspired railway hotel, the regal Château Frontenac towers over the still-walled compound of old Quebec City, alongside the St. Lawrence River. The latest round of renovations have ensured that the Château Frontenac’s hundreds of elegantly-appointed rooms are all unique and memorable; a variety made possible by the hotel’s many turrets and towers. Story by ManAboutWorld Global Correspondent, James Careless. Thanks to its towers, various seamless additions, and history of playing host to royalty and heads of state, the Château Frontenac’s roster of rooms range from premium singles to full-sized multi-room suites. The ‘basic’ Fairmont Room (akin to a basic Mercedes-Benz) starts at C$249/night. (In US dollars, this rate works out to 20-25% lower, depending on the Canada/US exchange rate). For more money you can get a Fairmont City View Room (C$289) or a Fairmont River View Room (C$309; my recommendation). If you can afford it, spending C$2500/night will get you a multi-room suite decorated to match the ambiance of past guests ranging from Winston Churchill and Queen Elizabeth to Celine Dion and Prime Ministers Trudeau (Pierre and Justin). The Château Frontenac’s location is one of the best in all of Canada. Located above the St. Lawrence River on a steep cliff alongside the vast Dufferin Terrace, this hotel is surrounded by centuries-old historic buildings that will whisk you straight to Europe – because when this area was settled by the French, European design and architecture was their touchstone. The hotel is located next to the Citadel fortress. Built by the French in 1673 to ward off the English, it is the oldest operating military installation in Canada. The Château Frontenac’s own site was previously occupied by the Saint-Louis Forts and Châteaux, where 400 year-old artifacts displayed in the hotel were found. Now covered by the Dufferin Terrace, the forts’ archaeological sites are open to visitors during warmer weather. The rooms within the Château Frontenac’s are tastefully decorated in a modern traditional style, with premium beds, furniture, and modern electronic amenities. The end suite that we stayed in was a very large studio with river and city views, lots of light, and extra couches and chairs to stretch out on. The bathroom was modern with lots of white marble, glass, and chrome. 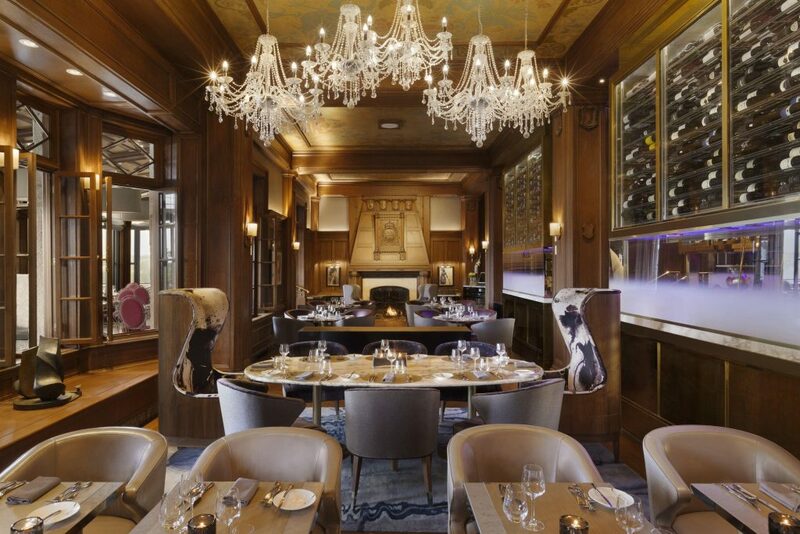 The Château Frontenac has an impressive selection of restaurants, bars, and lounging areas. They include the Place Dufferin overlooking the river, which offers the best hotel breakfast buffet I have ever tasted (and I’ve had quite a few.) The elegant Champlain Restaurant offers the latest in distinctive Quebec cuisine under the leadership of Chef Stéphane Modat. The 1608 Wine & Cheese Bar has access to an impressive wine cellar — and cold room of top Quebec cheeses in Canada. Or you can grab a drink and quick bite at the Bistro Le Sam; again with a great view of the St. Lawrence. As well, this hotel is home to the Club Frontenac health club (gym and indoor pool with view of Old Quebec); the Moment Spa Le Château Frontenac for massages, skin, and body treatments; and the Coiffure de Château par Angela Baughman hair salon. As North American cities go, Quebec City is pretty low-key when it comes to its gay factor. There are only a handful of ‘truly gay’ bars and health clubs; this ain’t San Francisco. This said, the Saint-Jean neighbourhood close to the Old City is known for its many gay-friendly restaurants, bars, and clubs. Places to check out include Club ForHom (221 rue St-Jean) and the historic Fou-Bar (5252 rue St-Jean). Usually we stick to one hotel in The Checkout. But if you make it to Quebec City this winter, you should check to see if the amazing Hôtel De Glace north of the city is still in season. 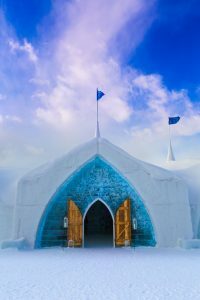 This is an astounding multi-room palace of carved snow and ice with many themed rooms, bar, and even a chapel for weddings. 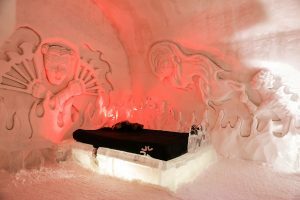 Located at the Village Vacances Valcartier resort – itself a wonder of chic, stylish all-season resort living – the Hôtel De Glace lets you camp out in an ice palace overnight. And if you get too cold, the package comes with a room in the adjacent Valcartier hotel included.